This is one of the most economical, efficient and popular standard tagging gun, making it operators preferred choice. Any Standard Tag Pin, Standard Hook Pin, Standard `V' Pin, Standard Ring Pin. We recommend to use it with our ARROW, WONDER or UNIVERSAL Standard Tag Pins. We are able to offer a wide qualitative range of Price Tag Gun. This gun is used for fixing tag pin. Arrow company with extra needle free. Checkpoint systems' meto needle taggers are the perfect tools for economically tagging many items, including furniture, fabrics, soft toys and clothing items. Choose from our fine, standard or heavy duty tagging needles to tag merchandize ranging from delicate lingerie to tough denim fabrics. We are the supplier of Tag Gun. 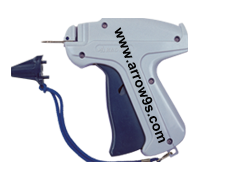 We are the leading supplier for Tag Gun in chennai, . Specifications: Condition: NewWidely used in packaging, labeling, tagging, etc. As a notable firm, we are committed to provide Tag Gun within the promised time frame. - Usage: Shops, malls, etc.